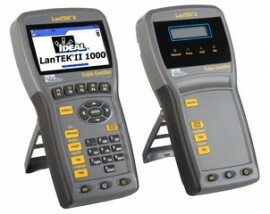 LanTEK II offers the best speed, performance and price available today. Nine second Cat 5e and 14 second Cat 6 tests with full performance data plus 10 Gigabit Alien Crosstalk testing that's more than 4x faster than other systems make LanTEK II the ultimate copper certification platform. The patented universal adapter systems lets you certify most cabling with off-the-shelf patch cords saving time and money by eliminating the need for proprietary permanent link adapters. The optional FiberTEK FDX modules provide the world's only dual wavelength, bidirectional fiber certification available that's more than 3x faster than existing testers. Three models provide the needed performance without the added expense; choose from 350 MHz/Cat 6, 500 MHz/Cat 6A or 1000 MHz/Cat7A all with accuracy independently verified by ETL. LanTEK II also offers ultimate versatility with options for certification of TERA, GG45 and EC7 category 7/7A systems, plus M12 industrial Ethernet and coaxial test adapters. • Battery: Lithium ion, 7.4VDC, 6.6AH; Input: 12V/2A DC; Typical operating time: 18 hours (new battery running a Cat6 test every 2.5 minutes, full backlight); Charge time: 4 hours quick charge with battery removed from handset, 6 hours inside handset. • Memory: Non-volatile flash, storage capacity for 1700 TIA-Cat 6 tests with graphs. Tests can be copied to USB flash drive, up to 64GB. - Cat 6/6A Class E/EA RJ-45 permanent link adapters: shielded and un-shielded cable, universal adapters provide channel, permanent link and basic link measurements. • Tone generator: Integrated into display and remote handset, compatible with standard analog inductive probes, selectable tone (high/low/warble) 500/600 Hz, selectable pin output.